Spinnaker’s Centrifugal Power Exhaust assemblies are designed for both down flow and horizontal applications. Units feature DWDI centrifugal blowers, TEFC motors, gasketed access doors, internal insulation, enamel paint finish, internal electrical compartment, and exhaust hood with gravity shut off damper. 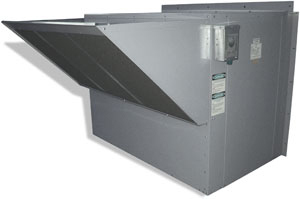 Standard designs are for air flow capacities of up to 75% of nominal unit air flow. These systems can also be upgraded to deliver 100% of required flow. Economizers can be added to simplify those installations requiring multiple accessories. Designs requiring variable airflow receive the addition of a solid state VFD drive unit.